Natural Bone. The reptilian order Loricata, which includes the alligator and crocodile, has changed very little over the past 180 million years. 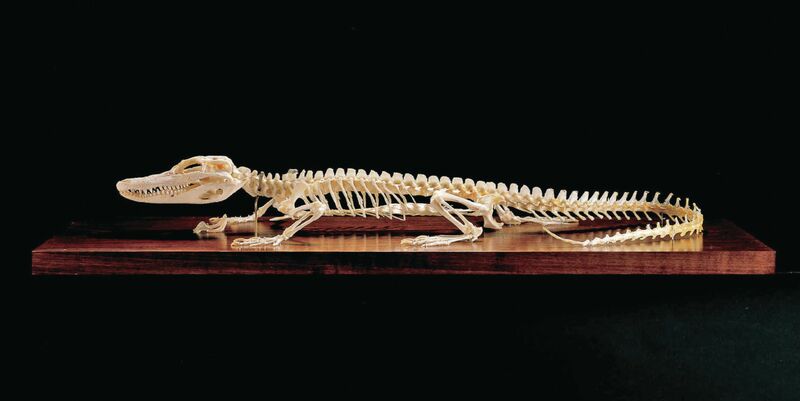 The meticulously prepared skeleton of Alligator mississippiensis has been cleaned and prepared by hand, preserving the cartilage, including the gastralia, or the connection between the ribs and pelvis on the ventral surface of the specimen. 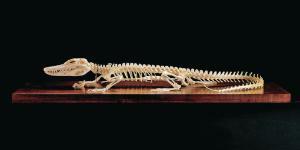 Our alligator skeletons are prepared from ranch-raised specimens and are never taken from the wild. Mounted upright on a base. Base size: 24"L x 8"W x 5"H.